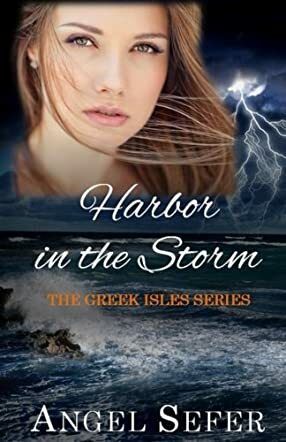 Harbor in the Storm: The Greek Isles Series, Book 6 is a romantic suspense novel written by Angel Sefer. While this is book 6 in her series, each of Sefer’s Greek Isles books is written as a standalone story that takes place on one of the Greek islands. Natalie Asimakis was concerned when her husband failed to pick her up at the Atlanta airport. He had promised to be there when her plane from Fort Lauderdale was scheduled to arrive, and it was several hours past that time. She was stunned when she saw Daniel McKenzie outside the airport instead. He looked as gorgeous as ever, elegantly attired in his Armani suit. She felt transfixed, watching him and remembering the intensity of their relationship, then she wanted to withdraw, quickly, before he noticed her. But he did notice her, and he seemed so glad to see her. He had also just returned from a trip and had a limousine waiting for him. She accepted his offer of a ride, seeing that her husband just didn’t seem to be getting there. Why had she ever married James Cassidy when she had never stopped loving Daniel McKenzie? Angel Sefer’s romantic suspense novel, Harbor in the Storm: The Greek Isles Series, Book 6, is a taut and thrilling story about a young woman whose life is abruptly torn apart when she discovers that her husband is not who he claims to be and that the killers looking for him are threatening to kill her and her aunt as well. Sefer’s characters work quite well within this story, and it’s hard not to hope that Natalie and Daniel survive the threats to their existence and find a way to rekindle their lost romance. I’ve long been intrigued by the loveliness and natural settings of the Greek islands, and loved learning about Skiathos, the island where Natalie grew up and where her family’s estate is. Sefer’s plot is well-constructed and the action keeps on coming in this suspenseful thriller of a romance. Harbor in the Storm: The Greek Isles Series, Book 6 is most highly recommended.